Putin's departure from office and the election of Dmitry Medvedev will usher in a new political era in Russia. It will establish the principle of limiting presidential power to two terms, which will in turn lead to other limitations. But the very fact that the country will have a new President is also important. A new leader means a new style, and that style will set the zeitgeist for the duration of his term. Medvedev's style, as has already become clear, is different from Putin's. The impression Putin creates is of a person who had a difficult childhood, and constantly battled to suppress his own weakness and lack of self-confidence, which is probably the main reason why he joined the KGB (work in a "strong" outfit confers strength). For such people the highest value lies in control of themselves and others. His chosen successor is a man from a very different mould. Medvedev will be the first Russian leader since the fall of tsarism to come from a comfortable, almost elitist background. He grew up as a secure child in a professor's family, who knew from early on that a comfortable career lay ahead of him. He comes across as a more outgoing and kinder man than his predecessor. There is no question of any ideological differences between Medvedev and Putin, yet even people who embrace the same ideology may take very different approaches to it, according to their mental make-up. Putin emphasised order and what he calls the "power vertical". A typical boy from a professor's family is a liberal. Medvedev's speeches have a whiff of "the thaw" about them, which has already made some of our liberals euphoric. Perhaps the most notable thing about his speeches is his recurrent railing against "neglect of the law" and corruption. Apparently the emphasis on law and order will be as much a feature of the "liberal" lawyer Medvedev's leadership as the emphasis on law and order and control has been of Putin's. Which prompts a question: to what extent can the shift in emphasis and style translate itself into a change in policy? Much will depend not so much on the bureaucrats' resistance to their new boss as on the inherent contradictions of Medvedev's own ideology as revealed in his public speeches. On the one hand, Medvedev has taken up Putin's favourite idea, that Russia has already had "more than its share of revolutions" in the 20th century and that preserving continuity and stability takes priority above all else. 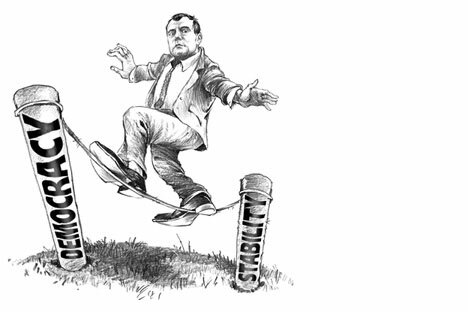 In other words, Medvedev simultaneously wants respect of the law, stability and predictability. But in a true democracy it is the rules of the game that are stable while the identity of the winner is uncertain. A transition to real democracy would be signalled by the victory of somebody who is not already in power nor anointed winner. And that would mean destabilisation and a kind of revolution, even if only a "velvet" one. Indeed, the idea that "Russia has had more than its share of revolutions" is but the latest manifestation of an age-old Russian fear of destabilisation. Our tsars repeatedly strengthened and reinforced the "power vertical", fearing even partial destabilisation that posed no direct challenge to their authority. The result was the 1917 revolution. The Soviet leaders also had the same violent phobia of destabilisation. The result was the putsch of 1991. Putin is afraid of destabilisation, and so is Medvedev. Of course, it would be absurd to expect a serving President to bring about a revolution or engineer his own (or his successor's) defeat. But if fear of destabilisation prevails over his "legal" aspirations, future historians will list the date of some other catastrophe alongside 1917 and 1991. Conversely, when faced with a choice between stability and law, the more often he opts for law, the more chances there will be that Russia has exhausted its potential for catastrophic revolutions. Professor Dmitry Furman is senior research fellow with the Russian Academy of Sciences' Europe Institute.